What's the best way for McDonald's to ensure that you spend your hard earned fast food dollars at their cash registers? Hook you when you're young. McDonald's has had a long history of child-directed advertising, with much of it not in the formal guise of advertisement. 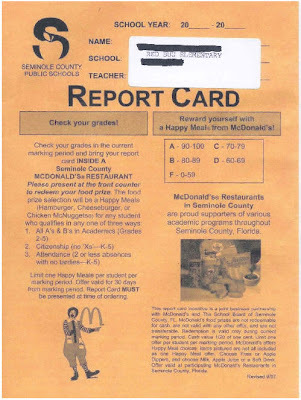 Well, here's a new one - team up with a local school board and offer free McDonald's foods as rewards for good grades. A number of bloggers have already written about this. "worried about how it explicitly links performance and self-esteem with eating fast food"
Marion Nestle from her What to Eat blog was wary about what else was in store from public-private partnerships with the food industry and steered people to the New York Times article which is critical of what they labeled as, "the commercialization of educational culture". Me, I'm not too upset with McDonald's. As I often remind folks here and in my talks, the food industry's job is to sell food, not to look after your health. While it might to many be an unappetizing and disingenuous way to promote themselves, I really don't think you can fault McDonald's for finding an innovative way to not only get customers through the door, but to link themselves with the tacit endorsement of schools in the promotion of the message that eating at McDonald's is something one should consider so great as to be a reward (and of course not just for scholastic accomplishments but for anything you might feel's worth celebrating with your child). No, the folks that I'd call to question are the members of the Seminole County School Board, a school board with at least a decade long tradition of selling out to Big Food whereupon according to the New York Times article prior to McDonald's picking up the $1,600 report card printing tab, Pizza Hut used to do it offering a personal pan pizza as a reward and with their logo in place of Ronald. If anyone is interested in writing to the school board, click right here and you can send an email to all of the members of the board and the board's superintendent, though I'd wager that with all the publicity to date, when this contract runs out, so too will fast food report cards.